More from San Miguel de Allende, Mexico! Everyone was refreshed from our day of free time as we met in our studio for my morning demonstration on Wednesday. Our plan was to paint inside the lovely Bellas Artes with it’s cool arcades and tranquil atmosphere. And it’s arches. I used my demonstration to dramatize the feeling of looking into a sunlit space through an arch. I kept my palette simple; cools and warms. For once, we had no shortage of shade. Most of the students were ready to tackle arches. Let’s see what happened with those arches! Remember to click on a critique image to view a larger version. Thursday was our last full day of painting. Our plan was to leave on Friday morning for Mexico City (more about that later). We had a lot on our agenda on Thursday so I decided not to offer a demonstration in order to give the group an extra hour of painting time. We walked up to Parque Guadiana, a quiet and pretty park in a residential neighbourhood. At the end of the day, we gathered at our studio for our Final Critique. I started out by looking at the Thursday paintings and followed that with a selection of work from earlier in the week. It was a nice way to look back on our painting time together. Wait a minute! What the heck is that bird doing there? One of our painters took a metalworking class while she was here and this was her chance to show us the result. 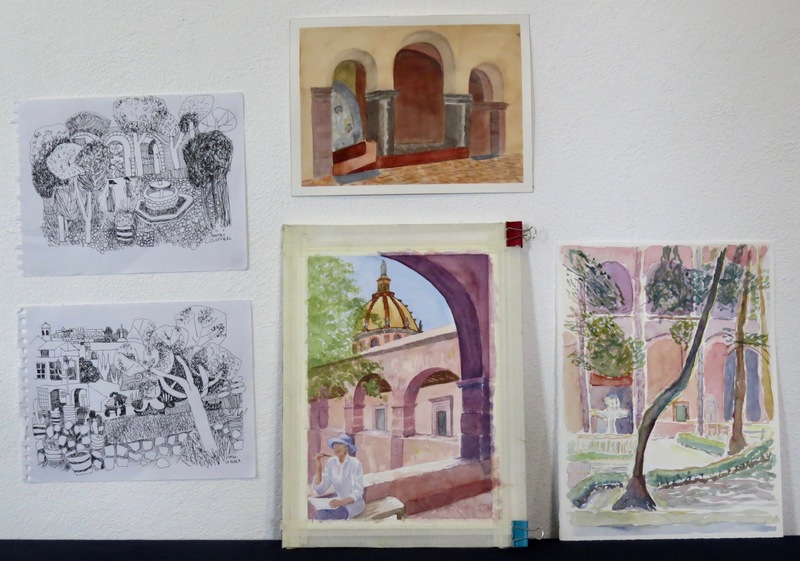 That was it for our supervised painting days and for our stay in beautiful San Miguel de Allende. My next post will be from Mexico City where we will visit the famous home of Frida Kahlo; Casa Azul. Hola from San Miguel de Allende, Mexico! I’m back in beautiful SM de Allende with a great group of watercolour painters. We arrived on Thursday and enjoyed our Welcome Dinner at the hotel. Friday was a relaxing day. I led most of the group on a tour of the town and the afternoon was free time for painting, shopping or just taking it easy. Things got serious this morning (Saturday). I gave a demonstration at the hotel, reminding everyone of the importance of value and pattern. Following that, most of the group worked on the hotel grounds for the day. The courtyard is lovely and spacious and our rooms were close at hand. 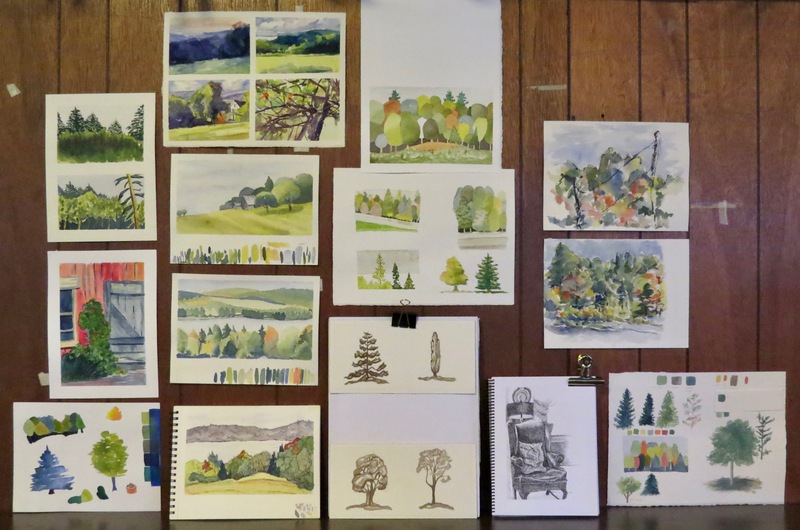 It’s a good way to start as we sort out the practical elements of ‘en plein air’ watercolour painting. It was a good start to our workshop. We convened at 5pm sharp for our first critique. Click on a critique image to view a larger version. I gave another studio demonstration on Sunday morning. This street scene was quickly drawn from memory. I discussed a ‘big to small’ process and varying washes to add interest. Also, we discussed what colours work when painted over other colours and what doesn’t work. For example, I can’t paint a green door over a red wall without getting a very dull result. After the demonstration, we headed to Parque Benito Juarez and it’s a lovely spot for painting. The park is very green and surrounded by attractive residences and hotels. Just up the road from the park is the outdoor public laundry. No-one was washing clothes today. It’s hot here but lovely in the shade. I discourage the painters from painting in the sun. A pleasant day in the park wound down and we returned to our studio for the critique. I left the hotel early on Monday and walked up to Plaza San Antonio, a quiet square with a brilliant white church. I set up my easel and prepared for an onsite demonstration and I was ready to go when the students arrived. The square has a large shade tree with a view of a street dropping down. I pointed out the importance of checking angles carefully in order to make the perspective believable. After we discussed that, I painted the scene with a flat angled brush. It was a very complicated subject so I stressed simplification as I took them through my process. Everyone sought out shady spots and got to work. It was nice to cool off in our studio at the hotel at critique time. Tuesday is a free day. Shopping, sightseeing and even more painting was on the agenda. We’ll be back at it tomorrow morning in sunny San Miguel de Allende. Vermont 2018 – Our Last Day was Friday at Glover! One more to day to go and the weather was beautiful! One more demonstration, as well, and I decided to offer two basic approaches to painting clouds. In my first study, all the shapes were drawn in pencil first. I left a fair bit of paper white on the puffy clouds but used an off-white wash in the ‘background’ clouds. Washes were allowed to dry before new ones were applied. The puffy clouds were painted one at a time. I started them with either clean water or a pale wash and touched in the darker values while wet. Very step by step and it took about fifteen minutes or so (using a hairdryer sped things up). My second study took about four minutes. Cloud shapes were loosely indicated with light pencil marks. I wet the sheet with water overall but left dry patches for the white of the clouds. The light blue went in next and the darker cloud values followed. The two different basic approaches were appreciated by the group. Of course, there are probably as many ways to paint clouds as there are actual clouds but one has to start somewhere. 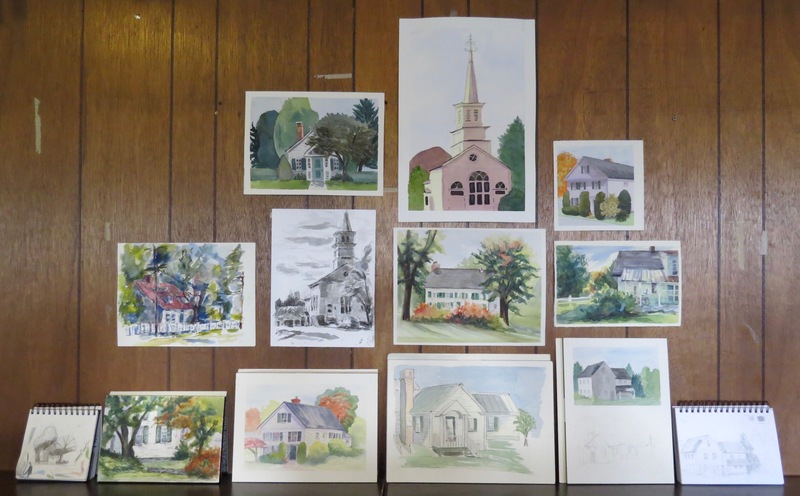 Our painting site was the town of Glover and it was full of Vermont character with a wonderful general store and Red Sky Trading. A short stroll took some of our painters into the rural countryside. The colours were out in their glory and it was another fulfilling and creative day. All good things come to an end, as they say. This was our last day and we had an evening itinerary. First, however, we returned to the Ski Hut Studio to look at our work from Friday. Remember to click on a critique image to view a larger version. On Friday evening, we enjoyed a fine Farewell Dinner at the Highland Lodge. Heidi, Chad, Brittany, Arnold and the whole team had looked after us very well all week long and our dinner was a great way to wrap up. There was musical entertainment, as well, and Heidi sang a song to our group of watercolour painters. It was the John Denver classic, ‘Leaving on a Jet Plane’. After dinner, it was back to the studio for our Final Critique. Each artist selected three works to show us and it was a nice way to summarize and recall our endeavours together. Several of the group stayed on Saturday and explored even more of the Northeast Kingdom but our workshop was over. Thanks go to all of our participants, the staff at Highland Lodge and the very friendly Vermonters we encountered every day. Thank you for following! Next stop is from March 21-31, 2019 in beautiful and safe San Miguel de Allende. Care to join me for a painting adventure in Mexico? Click here to view all of the details! Vermont 2018 – Wednesday at Bread and Puppets! I’m devoting an entire post to Wednesday (September 26). We woke up to more foul weather but I had a plan. I’d already made arrangements to sketch and paint indoors in the fascinating Bread and Puppet Museum. Bread and Puppet Theater is a celebrated organization that strives for social justice through wonderful outdoor performances. Click on one of the links here and read all about their endeavours! 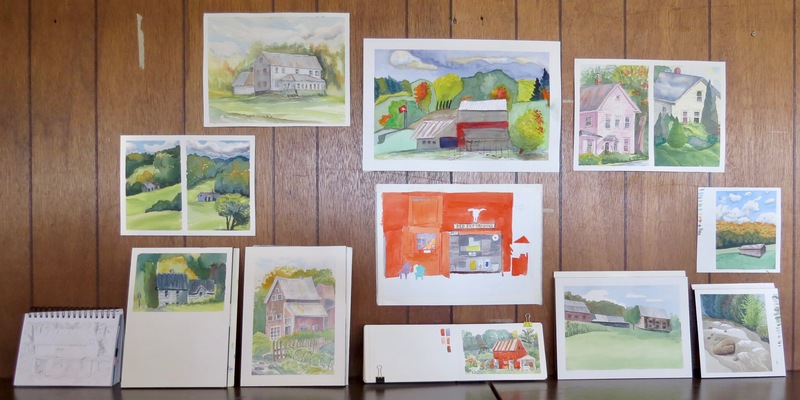 So, working ‘en plein air’ was put on hold for the day but painting in the museum was a terrific consolation and a unique Vermont experience. I had prepared a morning demonstration with the museum in mind. I used cool greys mixed from Cobalt Blue and Burnt Sienna to develop a value study. I’ve simplified the process to show you three steps. There are three values in Step One; the white of the paper, a light middle value and a darker middle value. I’ve preserved the paper white in the foreground to enhance a feeling of depth. I’ve added more values in Step Two. The greatest contrast is in the two foreground characters. There were some intermediate steps but this is the final version. Once the values were developed, I gently ‘glazed’ colour over the local areas. That was my offering for Wednesday morning. We headed to the museum and this is what we found. What a great day! Thanks so much to the Bread and Puppet Museum for hosting us. Now, let’s go back to Highland Lodge and the Ski Hut Studio for our critique. Don’t forget to click on a critique image if you’d like to view a larger version. We weren’t done yet in Vermont. Stay tuned for our exploits on Thursday and Friday. Vermont 2018 – First Two Days! I just got back from beautiful Vermont last night. A week ago Sunday, on the 23d of September, our group of Canadian and American watercolour painters converged on the lovely and welcoming Highland Lodge, which overlooks Caspian Lake in the Northeast Kingdom. Our generous host, Heidi Lauren, offered us cocktails in the charming bar before we enjoyed a delicious Welcome Dinner together. The following morning, Monday the 24th, we met in our Ski Hut Studio. I started the painting week off with a slide presentation with two themes. 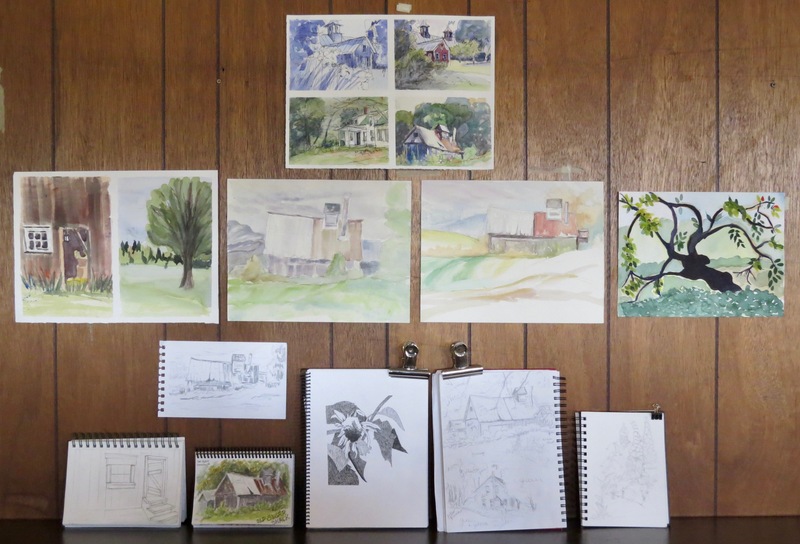 The first segment was entitled Planning Your Watercolour and focused on a sound process. The second part featured the work of acclaimed Canadian artist, A. J. Casson (1898-1992). Casson was a member of the celebrated Group of Seven; a ground-breaking group of Canadian landscape painters. 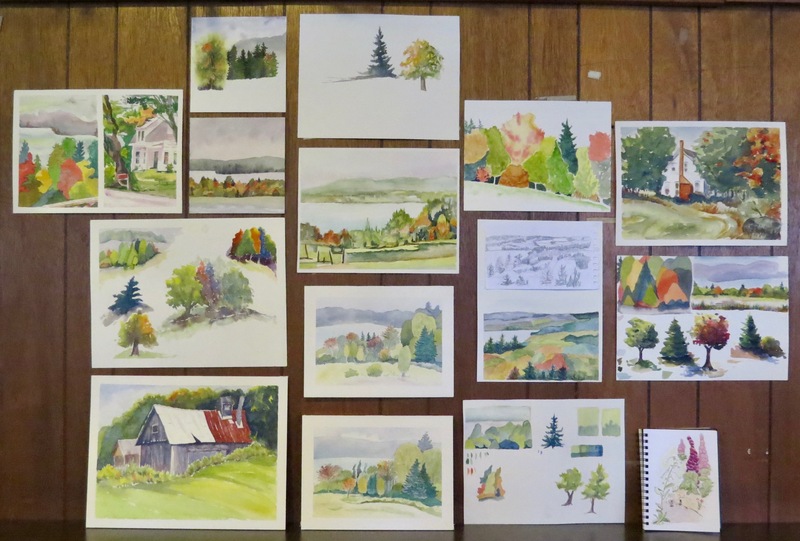 We took particular interest in how he simplified foliage in his watercolours and oils and how he dealt with fall foliage, in particular. After our studio meeting, we headed to the famous Greensboro Barn at Turning Stone Farm and were hosted by local artist, Jennifer Ranz. 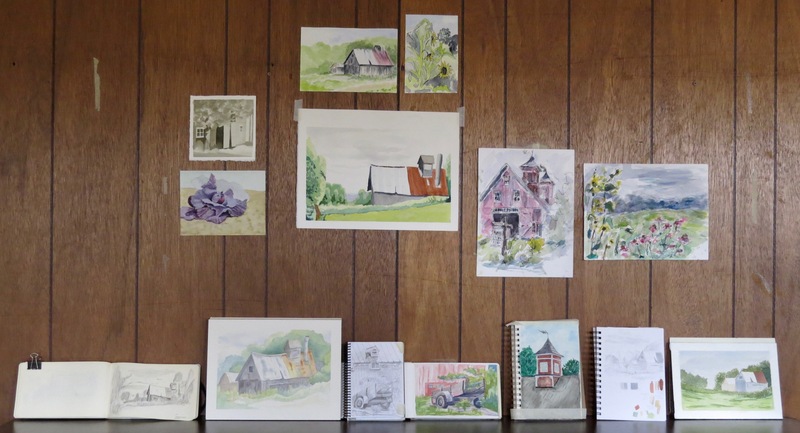 It was a wonderful painting site with a great variety of subject matter including the barn itself and a classic Vermont maple sugar shack. We settled in for the day. The painters spread out all over the property. It was overcast and cool but that doesn’t stop a keen bunch of ‘en plein air’ watercolourists! Eventually, it was time to warm up and have a look at the day’s work. It was a short drive back to the lodge and our Ski Hut Studio. Here’s the work from our first day. Click on any critique image to view a larger version. It was a grim day. Cool and wet. Fortunately, we had our spacious and well-furnished studio where we met for a demonstration. Looking again at the work of A. J. Casson, I discussed the simplification of foliage and greens, as well. Do you see the four swatches of green in the lower left corner? They were all darkened with the same wash of Cobalt Blue. Works, doesn’t it? The resourceful painters found several places to work for the day. The studio, the front porch, the lodge interior and even through the windows of their rooms and cabins. Of course, it helped that the Highland Lodge has a spectacular view. Undaunted! It was a productive day as you can see from our critique. Stay tuned for the next episode of our creative adventures. There’s lots more to come from Vermont. 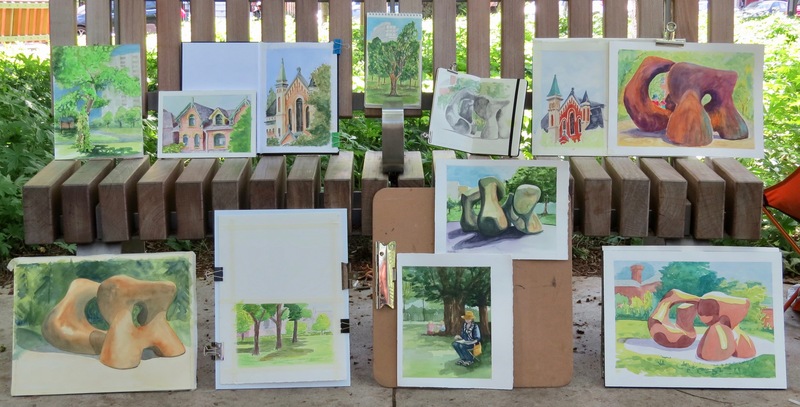 Plein Air Toronto 2018 – First Three Days! 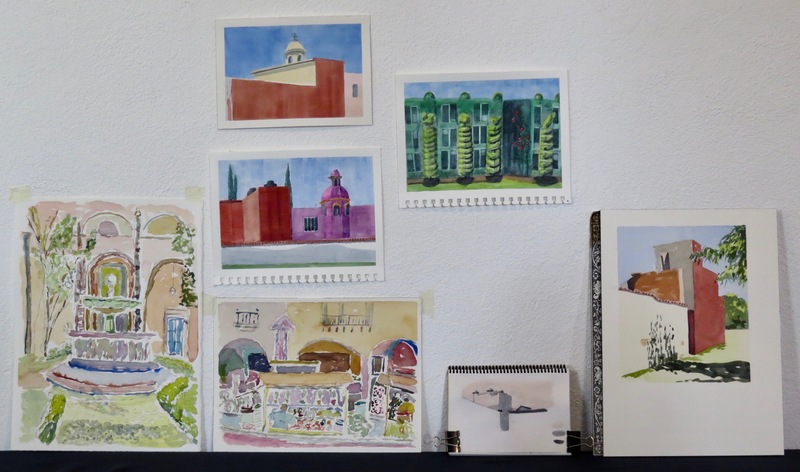 One week ago, on Monday morning, this year’s participants in our Plein Air Toronto week-long workshop met at the Arts on Adrian studio in the west end of Toronto. We had business to discuss and I provided everyone with information sheets on all of our sites. Carpooling was arranged. 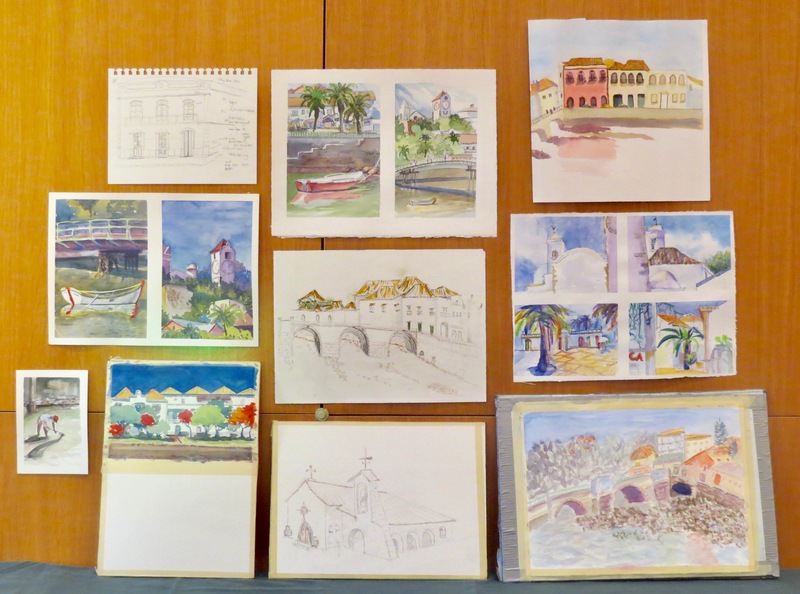 I followed the practical session with a Power Point talk which I titled Planning your Watercolour Painting. I’d been looking at Frank Webb’s book recently and noted the ideas I share with him about planning a watercolour. Frank Webb is one of the most successful contemporary watercolour painters so his ideas are meaningful. The first several slides of my presentation featured his thoughts and artwork. Also, I handed out a sheet of his tips on planning and recommended his book. Mr. Webb’s work was followed by several other historical and contemporary masters of the medium. 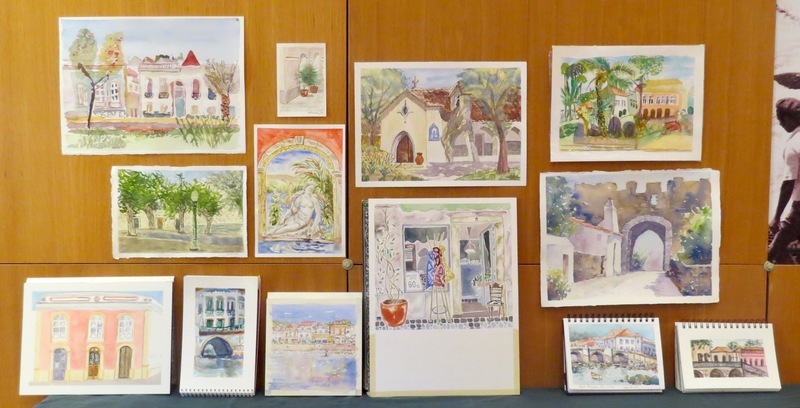 The participants enjoyed watercolours by J.M.W. Turner, John Singer Sargent and A.J. Casson, amongst many others. We spent an hour at the studio before heading to the lovely Sunnyside Pavilion on Toronto’s lakeshore. A thunderstorm threatened, and eventually the skies burst, but we were high and dry under the shelter of the pavilion’s courtyard. The clouds eventually moved off and we enjoyed a productive first day. We gathered in the late afternoon for our critique. Click on any critique image to see a larger version. We visited the Grange Park on Tuesday. The Grange Park is situated behind both the Art Gallery of Ontario and the art school, OCADU. A large Henry Moore sculpture is a landmark and we met in a shady spot with a view of the sculpture. I demonstrated, using the Moore as my subject. My goal was to illustrate a ‘light to dark’ and ‘big to small’ process; simplifying, editing and using value in order to draw the eye to the main subject. After the demonstration, the painters settled in for a pleasant day in the park. The sunshine lasted all day long. As usual, we wrapped up with our critique. Roundhouse Park was our venue for Day Three of our workshop. It’s in the very core of the downtown area, right next to the CN tower, the baseball stadium and the aquarium. The roundhouse hosts the Toronto Railway Museum and Steamwhistle Brewery. Rain was threatening (it never really materialized) so I worked very quickly at my demonstration, allowing washes to run together in places. I used a 3/4″ flat angled brush. Trains, old railway buildings, contemporary structures; Roundhouse Park has all kinds of interesting subject matter. Most novel outdoor studio of the week! Well-earned refreshment at the end of the day. Once again, we found a fairly private wall for our critique. I was very pleased with the progress of the artists. We’re more than halfway through the week already! Stay tuned for our final two days. Our hotel was about a mile and a half outside of Tavira in the Ria Formosa nature reserve. The complex is a restoration of a former tuna fishing camp. Our first day here was a free day. The students painted on the grounds or took the shuttle into Tavira. We gathered in our studio at the end of the day to plan for the days ahead. Also, I gave a demonstration of pen and ink with watercolour. A few days back, in Redondo, I’d done a small watercolour of some worn walls. At the time, I’d planned to add pen to it and I did so in front of the group, discussing my ideas and decisions as I worked. 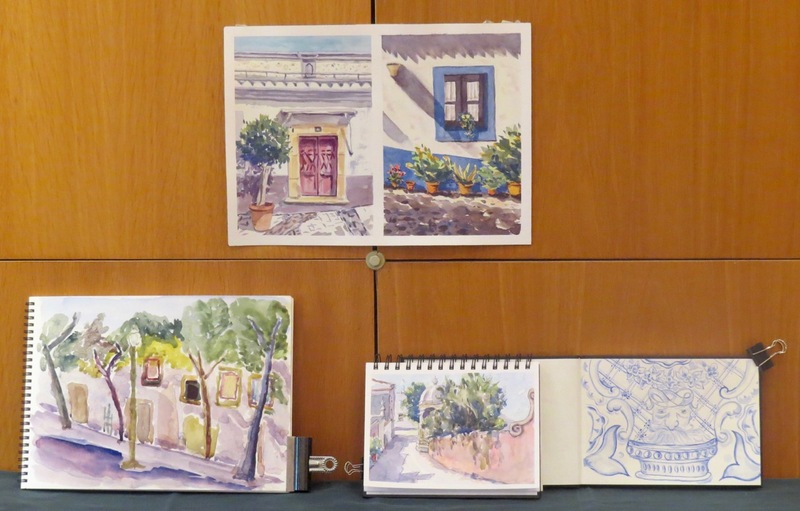 Many of the students enjoy combining watercolour with pen. 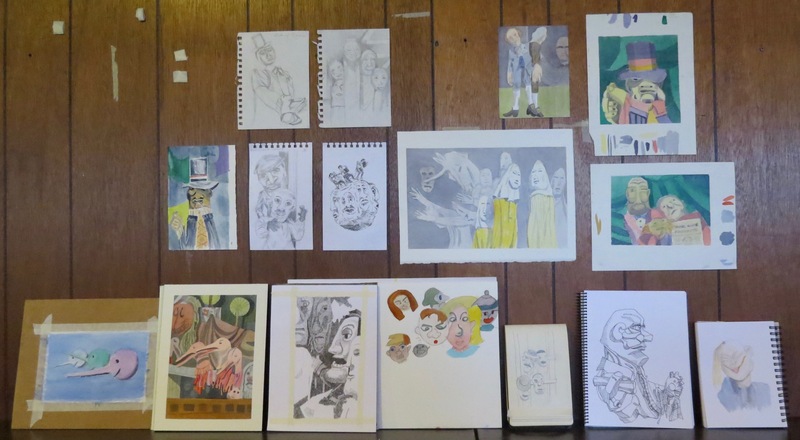 Some use it primarily as a sketchbook approach and others create more sustained works. On Sunday morning, we boarded our bus and drove to Estoi. We were the hosts of the pousada (hotel) in the stunning old palace of Estoi. We were allowed to paint on the grounds and many of us worked in the adjacent town, as well. Everyone got together at 1pm at the palace for a spectacular lunch. Later in the day, a tired group boarded our bus for the half hour ride back to Tavira. The day wasn’t over until we’d had our critique. 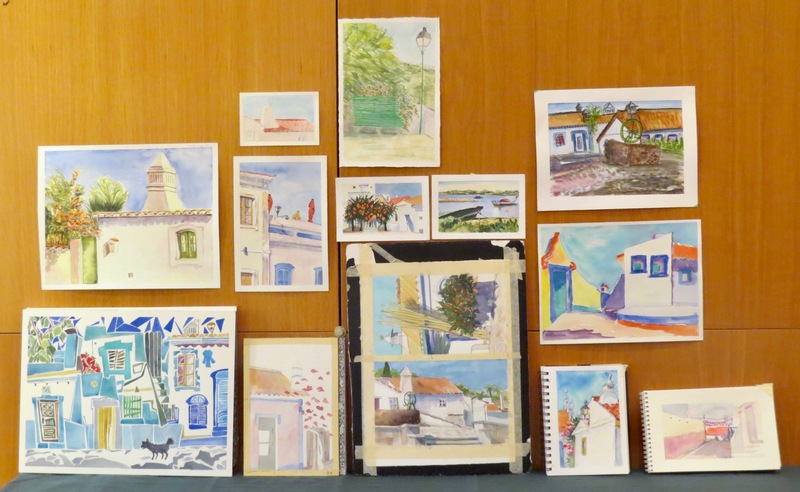 We stayed close to home and painted in Tavira on Monday. It’s a lovely town along a river which is spanned by the ancient Roman bridge. Everyone we encountered was friendly and welcoming. 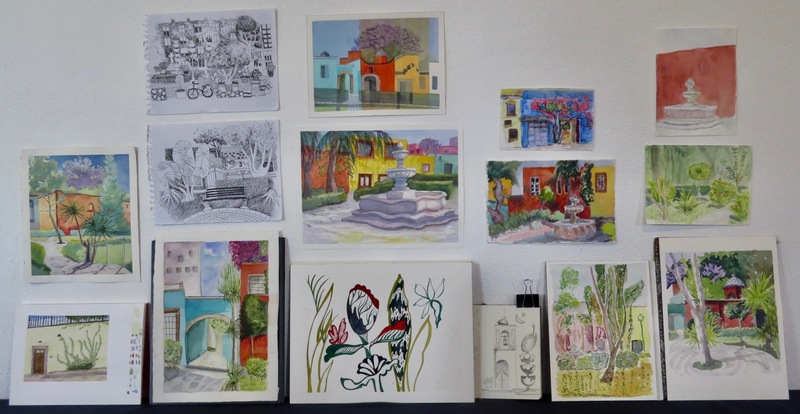 Our rooms in Tavira were decorated with prints of the watercolours of German artist, August Macke. The watercolours had been painted over one hundred years ago in Tunisia. At the time, Macke had been accompanied by Swiss artist Paul Klee and French artist Louis Moilliet. These Tunisian scenes were full of glowing white buildings and colour! Very similar to our surroundings in southern Portugal. I had prepared a demonstration ahead of time to share with the group. 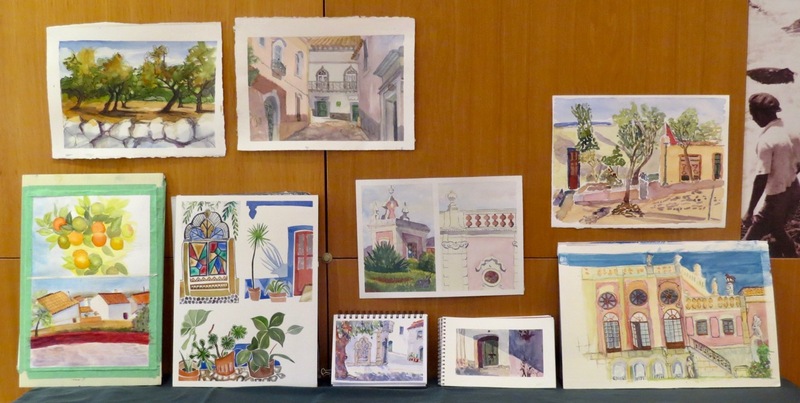 It’s a scene from Tavira and in it I’ve stressed simplification, colour and playfulness. Would it influence the students at all in the days to come? We had another wonderful day trip destination on Tuesday; the clifftop, typical Algarve fishing village of Cacela Velha. It’s not very big but it’s quite charming and the views of the ocean and coastline are fabulous. Most of our artists settled in to paint in the village but some explored the beach below. We had another tasty group lunch at the local restaurant and continued to paint until the end of the afternoon. It was a short hop back to our hotel and we held the critique right away. There was a great deal of work to savour. While in Cacela Velha, I’d done a small watercolour using a 1/2″ flat angled brush. I showed it to the group and discussed simplification (again) and a few other ideas. We had a great time in Tavira. 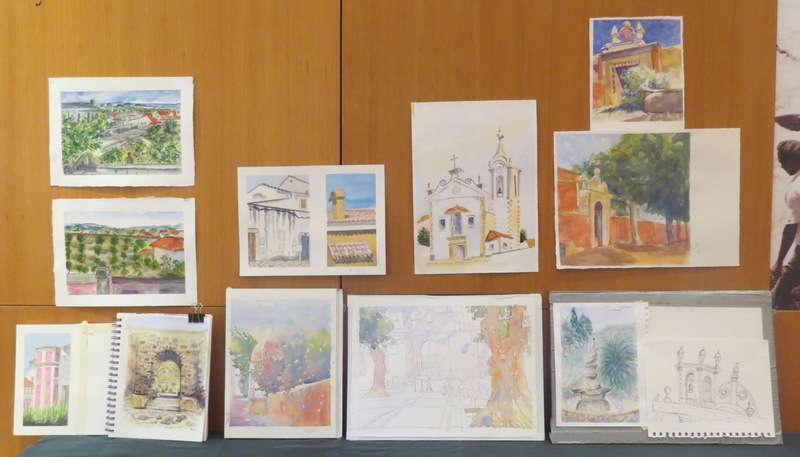 There’s one more stop on our painting tour of Portugal. We moved to Cascais on Wednesday. Stay tuned for our exploits in Cascais and the final days of our trip. Thanks for commenting, liking and following! Friday was a travel day. We were headed to Tavira, a town in the Algarve, from Évora. Enroute, we stopped for four hours in the scenic hilltop town of Mértola. There was lots of time to explore, sketch and relax over a nice lunch. The big tour buses can’t make it very far into town because of the narrow streets. I’d arranged for a shuttle and it took us all the way up to the castle. The views from the walls were splendid. As usual, shady spots were sought out for sketching. Cafés were also a priority. Wandering around turned up all kinds of interesting things. Back to the bus! We had a little over an hour to go before arriving at our new hotel in Tavira. Stay tuned!